Humor « How Do You Measure 525600 Minutes? The origins of most Christmas traditions can be easily researched on the computer. Some are quite interesting and the variations of traditions in different countries and cultures are fascinating as well. But what about those confusing lyrics of Christmas songs? Have you ever listened to a song and wondered, exactly what they were thinking? Here are ten questions that came up as I was listening over the past week. Rockin’ Around the Christmas Tree…. Seriously? Does anyone do this? I don’t even own a rocker. Am I missing out? Can someone tell my why Julie Andrews ate a big bowls of prunes (instead of a spoonful of sugar) before recording Silent Night? Was all that puckering really necessary? AND– with all those verses–exactly how silent could it really have been? 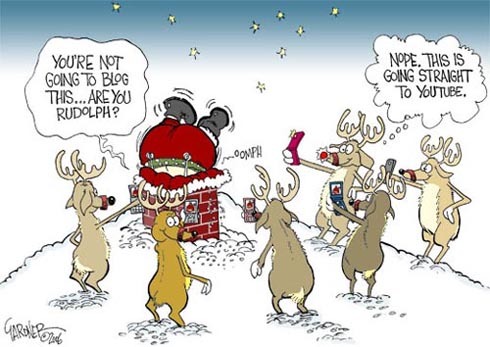 Why was only one whore soaping the sleigh? Wouldn’t it have gotten done faster if they all pitched in? Is this like a sleigh (car) wash or something? Is it a euphemism? And how did she jingle bells with a sponge and a hose in her hands? Jingle pasties? 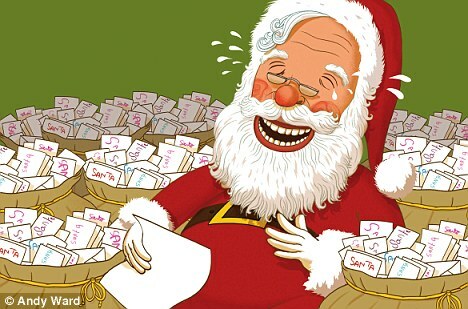 What if Santa Claus doesn’t get your letter? AND- you were good… really good. Does that give you an excuse to turn bad? Was the guy that wrote The First Noel, kind of like the Sheldon of the 18th century? (knocking– “Noel, Noel, Noel Noel…Noel, Noel Noel…”) And how was he so sure there weren’t other Noel’s he just hadn’t met? Why wasn’t Susie Snowflake arrested for stalking? Obviously, she was a white girl. #blacklivesmatter Too soon? Why did she tap on the window instead of sending a text? Did anyone ever think that just maybe Santa was feeding Rudolph GMO feed and that’s why his nose glowed? Exactly how much Rum-pum-pum-pum did Bing Crosby and David Bowie consume when recording The Little Drummer Boy? Does Adeste Fideles have the same side effects as Cialis? After the 12 Days of Christmas— Did My True Love ask for half back in the divorce settlement? Let It Go is NOT a Christmas song! So, please– Let. It. Go. Now you know why I don’t do comedy.